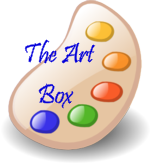 The Art Box – Oct. 11, 2010 | Tired, Need Sleep. In the Art Box last week: lots of colored paper, watercolor paper (in the back with a paperclip on it), watercolor paints, watercolor pencils, markers, glue, glitter glue, scissors, a small container with little goodies in it for collaging (lower left), a pinecone, stickers, and cardboard ribbon spools. Despite the plethora of good art supplies, not much art was done. We’ve had a run of summer-like days this fall (I guess to make up for the fall-like days we had in summer), and much of our time was spent outside. Some beautiful items did make their way into nature collages, but those are for a post later this week. However, despite the beautiful weather, M can’t resist anything sparkly. Once he saw the glitter glue and some sparkly bug stickers he had to take time out from his outdoor play to put a couple of things together. That was it. Just some quick bling and then back to jumping in the leaves. We’ve got 4 of them up in a variety of places – stairwell, family room, bedroom. My (unspoken to M) hope is that I can s l o w l y start taking down a few pieces of art that he’s just randomly taped on the walls and move them onto the art strings, and eventually only have M’s art on the strings except for a few very special things that we’ll leave in the kitchen, perhaps in frames. That’s the plan, anyway. I keep meaning to put up some art strings in our home - I think it's a great way to display art! I love the art string idea. I should do something like that. I never know what to do with all the artwork the kids make! I put one of the art strings up in my house too. I probably need to do more...the one I already put up is full! We also have an art string - in the kitchen. Usually Anna is pretty OK with an idea of "updating" her art show - as long as there is something there. M's collages are very sparkly indeed.